As there is less than an hour left in this day, I'm going to assume that this post will be read in the morning and so, I'd like to give you a little food for thought to go with your Friday morning coffee. Sound good to you? Great. Randomly tonight, one of my favorite movies from my childhood popped onto AMC and it wasn't what you might expect it would be. 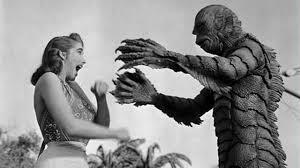 Creature From The Black Lagoon (1954) has a special place in my heart probably because its the only scary movie that I've watched more than once. Its plot revolves around a simple premise that there's a half-man, half-reptilian creature lurking in the depths waiting to grab your ankle as you swim - a thought that still evokes terror in both me and my sister. Because, after all, scientists are finding new species all the time, right? Just because most of them are thimble-sized frogs doesn't mean that one of them couldn't be the Creature from the Black Lagoon. But one thing is for certain - we can't be the only family out there that has a weird affinity for some random early fifties horror flick. Okay, maybe yours isn't a horror movie and maybe its a tad more current (or not!) - but what's that movie that only you and your family (insert 'friends' here as appropriate) understand? Figure it out - and then try and track it down. It's going to rain this Saturday (buckets people - get your sump pumps ready!!) so plan ahead and re-watch something you used to love. I certainly enjoyed it!! OMG! I saw it last week too! I bought it at the video store because it was a Movie of the week on Warner Cable... the old Avalon, NJ cable TV. The reception was so bad at the shore that everyone had cable in the 60's. Literally... They played it every day for a week..and we watched..every day! Young frankenstein!! Just saw it last week. Truely a family fav!!!! !.what knockers!!! !